Our March 2013 Oahu Trip Report: After Hurricane Sandy and a crazy Nor’easter blasted the tri-state area during the fall of 2012, we were ready to escape to the land of sunshine and rainbows! Since we knew we were going to splurge a bit on our 5-year anniversary trip to Maui during fall 2013, we only wanted to do one island on this trip, and knew that Oahu was where we could get the most bang for the buck. We love Oahu and we don’t get tired of it. Our foodie-nature was calling out to us and we were looking forward to happily munching our way around the island. 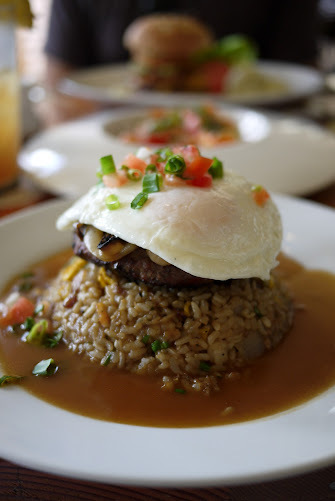 looking forward to one of these, a loco moco Alan Wong style. Flights: Steve and I took advantage of some pretty decent fares from NYC to HNL on Hawaiian buying propecia online Airlines, or at least I thought they were well -priced. Little did we know prices would drop substantially within a few months. I believe this happened because there was an oversupply of flights to Hawaii and demand had not risen as expected. It wasn’t a total loss for us because I had used a discount coupon which I received when I was approved for the Hawaiian Airlines visa card from BoA which gave us 50% off a companion flight…so the new low prices were in line with what I initially paid. What I was annoyed about was that if I only had waited, I would have saved EVEN MORE – the coupon would have been applied to the low price and it would offer a substantial savings. A little peeved, I had emailed Hawaiian Airlines and also called their customer service to see if there was anything they could do. Long story short, Hawaiian Airlines doesn’t really have a price guarantee policy. They do however offer to change your flight but for a hefty fee, therefore negating all discounts that you would have received. Hawaiian Airlines has since cut back on the number of flights from the East coast so I expect the prices to level off with only moderate discounts. Although I really do like flying Hawaiian Airlines, I wish they would improve their policies a bit. I know airlines such as Alaska Air would have refunded me the fare difference with no questions asked. As a consolation, they offered us 2 free checked bags a person round-trip, which is I guess a nice gesture since the value of that is about 100 dollars. Lodging: a week at a condo booked via VRBO.com, and then 3 nights at the Turtle Bay Resort booked on a package from Travelzoo which included a resort credit, welcome amenity, early check-in, and late check-out. Car Rental: 10-day SUV rental from Alamo via Priceline – Anyways, sorry for the little rant, and on with the Trip Report! Day 4 – There’s barely anyone at the beach and yet…a drowning? Day 10 – Our last meal in paradise, Aloha with a side of burger!